In a large non-stick pan, cook the chorizo over medium-high heat until cooked. Drain the fat over paper towels. Clean the pan with a paper towel. Add the olive oil and shallots, and sauté until fragrant, for about 2 minutes. Add the Brussel sprouts and cook over medium heat, stirring occasionally, until brown and slightly soft, for about 8 – 10 minutes. 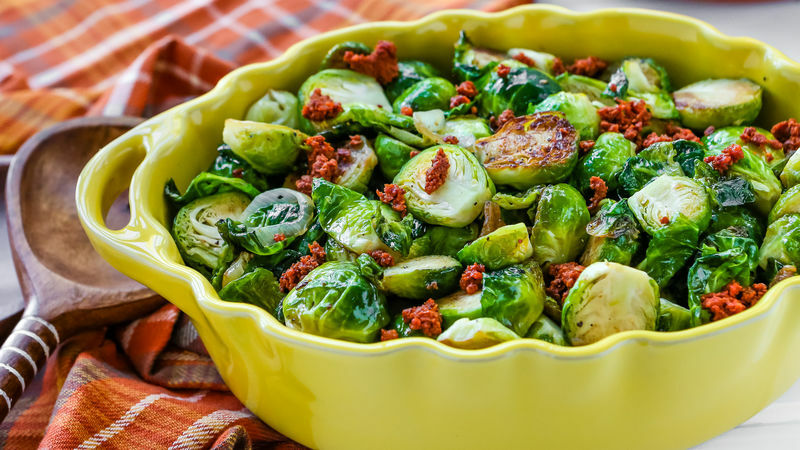 Sprinkle the chorizo over the Brussel sprouts. Season with some ground black pepper, if you’d like. Serve immediately. You can use bacon or pancetta instead of chorizo.